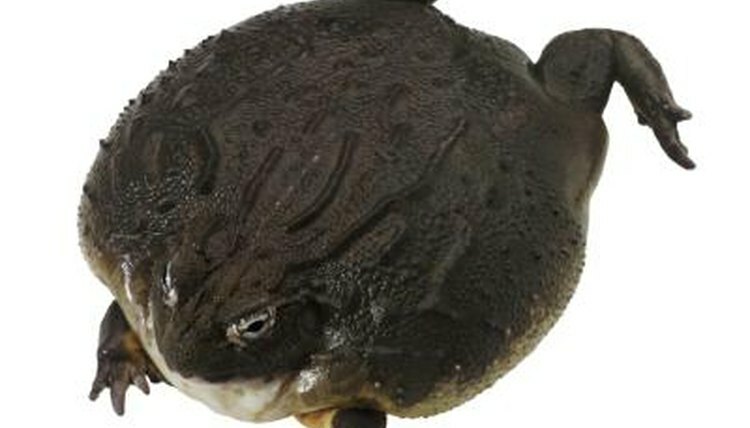 The pixie frog is the largest amphibian in south Africa, and the second largest frog in the world. The west African Goliath frog is the only species known to be larger. The pixie frog, also known as the African bull frog due to his huge size and deep voice, adapts to temperature extremes dropping below freezing, and rising to over 100 degrees Fahrenheit, for extended periods of time. Pixie frogs have large, broad bodies. Males can reach up to ten inches in length and weigh up to four pounds. Females are larger than males in most amphibian species, but female pixie frogs are about half the size. Male pixie frogs are olive green, with yellow or orange throats and underbellies. Females are lighter green, with white throats and underbellies. Both sexes have spade-like appendages, used for digging, on their rear legs. Pixie frogs live in southern Africa, in tropical and subtropical savannas, near fresh water sources, such as lakes, ponds, puddles, marshes, ditches and canals. During temperature extremes and dry seasons, they live in burrows underground to escape the heat or cold, tightly wrapped in a cocoon made from dead skin cells, which protects them from moisture loss. Pixie frogs can survive underground, in a dormant state for many months, emerging when the rainy season begins. Pixie frogs have large appetites and will eat almost any moving thing they can swallow. Their diet consists of bugs, fish, mice, birds, other frogs, reptiles and small mammals. Pixie frogs don't chase their food; instead they hide, waiting patiently, and ambush creatures that come close enough to be snatched up. Natural predators of the pixie frog are turtles, monitor lizards, large birds and humans. They are considered a culinary delicacy by many people. Pixie frogs emerge from their burrows when the rains come, hurrying to establish breeding territory. Once territory is established, males begin their deep mating calls. Females are attracted to the largest males. The female lays up to 4000 eggs. The male keeps the eggs moist and defends them from predators, until they hatch two days later. Tadpoles take 19 days to morph into small frogs. Maturity is reached in two to three years. Poison Toads Found in the Northeast U.S.